The Firepod portable pizza oven is easy to use, easy to move, and designed to deliver perfectly crisp pizzas in about four minutes. What’s not to like? It's powered by propane to get piping hot (600° Fahrenheit in about ten minutes) and is easy to manage. 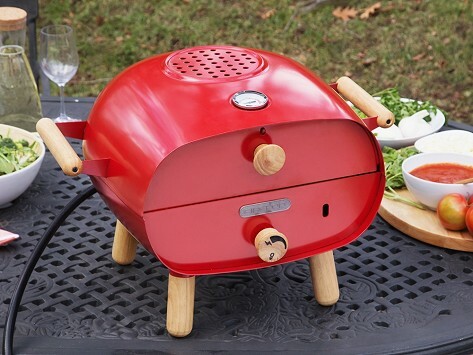 The mod design is made with powder-coated stainless steel and wooden legs and the grill comes with everything you need for a backyard pizza party—a pizza peel, two pizza stones, grill gloves, and a carrying strap for when you want to move it. Dimensions: 22" x 18" x 15"
The Firepod creator Tim Henderson was inspired to create a portable pizza oven after eating the best pizza of his life. During a trip to the Italian Alps, he found pizza nirvana and learned the secret to getting perfectly crisp results: cooking it at 600° Fahrenheit. Though he was now armed with that knowledge, Tim was far from making his own perfect pizza at home. Standard kitchen ovens don’t reach that high temperature, so he looked to electric and backyard-based wood fire ovens and found those to be lacking, too. He made Firepod to check off all his must-have boxes. It hits 600° Fahrenheit in about ten minutes and cooks a pizza in around four. It’s propane-powered so it’s super easy to use and it's portable, too. The Firepod was designed with backyards and patios in mind and it can serve as your all-around grill for when you don’t feel like pizza. (Is that possible?) And all the accessories you might need are included, from the pizza peel and stone to gloves and a handy carrying strap. Thanks to Firepod, a trip to the Alps isn’t needed to enjoy tasty pizza—only a trip to the backyard.